Huge galaxies eat smaller neighbors that feel the pull of their gravity. Huge galaxies have to eat their neighbors to keep growing, a new study reveals. A survey of 22,000 galaxies showed that the largest among them are nowhere near as good at creating stars as smaller ones. Instead, the massive galaxies snack on dwarf galaxies and expand. You can watch a video animation of a galactic merger. "All galaxies start off small and grow by collecting gas and quite efficiently turning it into stars," lead author of the study Aaron Robotham, a postdoctoral fellow at the International Centre for Radio Astronomy Research, said in a statement. "Then every now and then they get completely cannibalized by some much larger galaxy," added Robotham, who is based at the University of Western Australia. The Milky Way is now entering the stage where it will be easier to grow by cannibalism rather than fuelling its own stars. In 4 billion years, the galaxy will swallow the nearby Large and Small Magellanic Clouds. But a bigger fish is coming: In five billion years, the massive Andromeda Galaxy will merge with our own. Cannibalism becomes more efficient because the larger galaxies each have a strong gravitational field that nabs neighbors. The mechanisms of star formation, while still poorly understood, likely slow down because of "extreme feedback" in the center of the galaxy. "The topic is much debated, but a popular mechanism is where the active galactic nucleus basically cooks the gas and prevents it from cooling down to form stars," Robotham said. 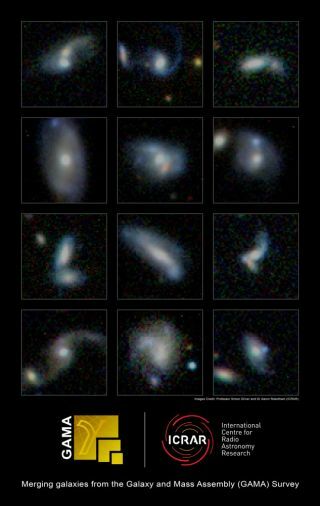 This means that billions of years in the universe's future, galaxies will become so entwined with each other that they will create a small number of super-giant structures, the researchers added. The research is based on observations with the Anglo-Australian Telescope in New South Wales, under the Galaxy And Mass Assembly (GAMA) survey. It was published in the Monthly Notices of the Royal Astronomical Society.